We need a new hero! Heroes of Hellas 4: Birth of Legend is a recently released match-three game where you get to match tiles on the board and save Olympus from destruction! It is a chain type match-three game with a lot of activities to offer on your way to victory. Olympus is under attack (aren't they supposed to be gods in there and aren't gods supposed to be stronger than anyone and anything else) and you become the one who stands up to the enemy. The game allows you to unlock 15 bonus levels to keep the fun going. I know...I know...enough with the story, tell us about the gameplay! Well, there isn't much more to the story anyway. 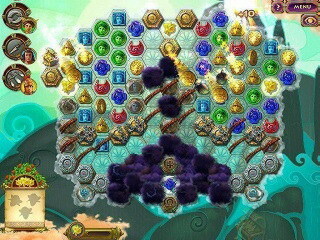 The game can be played in Timed or Untimed mode. The timed mode obviously requires better skills and strategies. The game allows you to unlock 15 bonus levels to keep the fun going. and to keep the challenge up you can earn 12 achievements. You want to come up with as long chains of matches as possible. Those give you coins that can be used as any color or type of tiles for the future matches. You will occasionally get power-ups on your board and you want to incorporate them into your chains of matches to get to use them. Some of the power-ups, like Hermes for example, need to be refilled to be used on the board. All those power-ups are great because you also get all kinds of blocks on your board. There are clouds that cover parts of your board or ropes that need to be removed. Stone monoliths require not only a match but a same symbol match to be removed. There are lots of different nuances and details about this game that you need to learn if you are shooting for the best score. 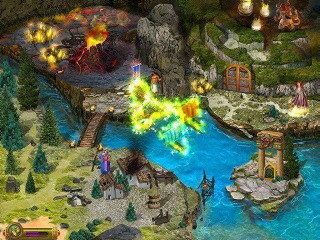 The scenes are colorful and bright creating a nice setting for a match-three game. It is a great chain match-three game that even those who are not fans of this type need to check out. It is one of the most loved ones out there! This is Heroes of Hellas 4: Birth of Legend review. Download this game here.